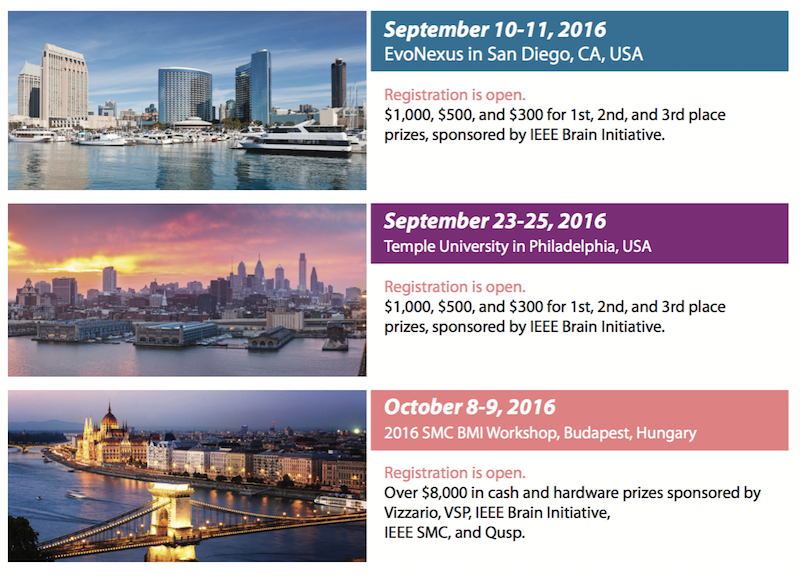 Prizes: $1000, $500, and $300 IEEE Brain Initiative prizes. September 10 - Start Hackathon. September 11 - Winners awarded. Why do a Brain Hackathon? The brain hackathon provides an environment for innovation and entrepreneurship. By putting creative minds from multiple disciplines together for a short period of time, we have the opportunity to discover and uncover new possibilities for using neurotechnology hardware and software. Hacks and innovation developed from hackathons have great potential for commercialization. What is a Hackathon? Hackathons are brainstorming and collaborative marathons designed to rapidly produce working prototypes. Conventional hackathons typically bring developers and technologists together over 24, 36, 48 or more hours to cram and build solutions that they can present. Who Can Participate? Anyone! If you have an interest in BMI, BCI, robotics, AR, VR, machine learning, sensors, human-machine interface systems, digital health, quantified self/health, control, signal processing, big data, haptics, rehabilitation, and similar areas. You do not have to be a neurotechnology expert to participate on a team! Interdisciplinary teams with a combination of neurotech and non-neurotech skills are often successful in building solutions and producing working prototypes. Define your project concept and build your team (use the Forum to brainstorm ideas and network). Teams can be 1-5 individuals. What is the IEEE Brain Initiative? The IEEE (Institute of Electrical and Electronics Engineers) is the world's largest technical professional society (nearly half a million members in 160 countries) dedicated to advancing technology for the benefit of humanity. The IEEE Brain Initiative addresses a Grand Challenge put forward in 2013 by the White House and is the IEEE's new flagship effort towards advancing neuroscience and related technologies to address the greatest scientific and technological challenge of our time: unlocking the mysteries of the human brain and mind.